Book Review: Lutz van Dijk's "Themba: A Boy Called Hope"
Themba: A Boy Called Hope was written by Lutz van Dijk, a German-Dutch author who has been living in South Africa since 2001 and translated into English by Karin Chubb. When I was first contacted by Aurora Metro Books, the publishers of Themba, to review it I have to say I wasn't quite sure what to expect. The synopsis states: "Growing up in rural South Africa, Themba dreams of becoming a football player", and I'm not the biggest fan of football. So I wasn't sure if I'd be able to survive reading a book about football. The verdict: I enjoyed it a lot more than I thought I would. And I would like to thank Aurora Metro Books for giving me the opportunity to read and review this novel. 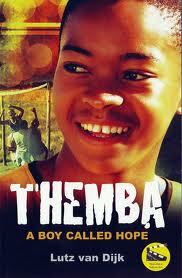 At the beginning of the story, Themba has realised his dream of becoming a football player. How did this boy from rural South Africa, end up playing for Bafana Bafana? Well, Themba tells us his story. He may live in poverty with his mother and younger sister, Nomtha, but the three of them are able to survive with the little they have. That is until their mother loses her job and is forced to migrate to the city for work. She ends up leaving her children behind in the care of her new boyfriend, Uncle Luthando. As their home life is no longer ideal, and their mother has also stopped sending them letters, Themba and his younger sister venture to the city to look for her. There Themba is faced with both hope and despair, and with time a secret that could affect his dream. While football is the backdrop to Themba's story - it is his dream after all - there is more to this story and his journey than just football. It's also about hope and triumph in the face of adversity. Football is his way to escape from his surroundings - poverty and unemployment - but another theme that runs throughout the book was HIV/AIDS. For me it was less about the issue of getting HIV/AIDS and more of the silence, secrecy and shame surrounding it. Quite a few characters in the novels were either rejected, ostracised, or isolated because they had AIDS. People were ashamed to let anyone know they had HIV/AIDS and would much rather hide in shame and die than get the treatment that is necessary to ensure a longer life. It goes to show that as much as awareness raising is important, there is also a need to address the stigma associated with it. So more than football, Themba is also about gaining an understanding of living with HIV/AIDs, not only for those who live with it everyday, but also from their family, friends, community, and society. "... in spite of general information and in spite of even the highest politicians publicly wearing AIDS ribbons, this illness is still largely denied and ignored by many of those directly affected ... [w]e are still a long way from recognising and respecting people affected by HIV and AIDS, not only in South Africa, often also in other parts of the world. We need many more examples of courageous action and engagement in everyday living before there will be a real change".